​Music By The Sea conducts monthly (first Saturday of the month) concerts at the Sandgate Town Hall. The concert series began in 1997. Program presented is classical, folk, jazz and world music. The Sandgate Town Hall is a heritage listed architectural gem with superb acoustics. It has been restored in 2011 with new air-conditioning, dance floor, lighting and sound. Performances are intimate, giving the audience a much greater experience than a performance in a large concert hall. At various times, Music By The Sea programmed music for the Australia Day celebrations and Einbunpin Festival with local musicians. In 2000, Music By The Sea was an initiator and co-founder of the Seaside Symphony Orchestra (SSO). It was unique in that it invited musicians at all levels of playing ability to join. During the time it called Sandgate home, the SSO performed several times for MBTS and other local festivals. MBTS presented the Premiere of SSO performing the Moreton Bay Suite, a composition by a then local, Tom Millar. It was also performed by the Brisbane Chamber Orchestra and eventually Moreton Bay Suite was recorded onto CD. The SSO merged with the Moreton Bay Symphony Orchestra in 2010. From 2002 to 2018 the annual Music By The Sea Festival programmed many local Sandgate and Brisbane solo artists, bands, dancers, poets and actors. MBTS produced two sold out Velvet Cellar Cabarets, which were the products developed from original ideas of Sandgate based, performing artists. In 2003, MBTS Festival premiered then local, Andre Reginato’s composition, Concerto for guitar and orchestra. Performed with Seaside Symphony Orchestra. 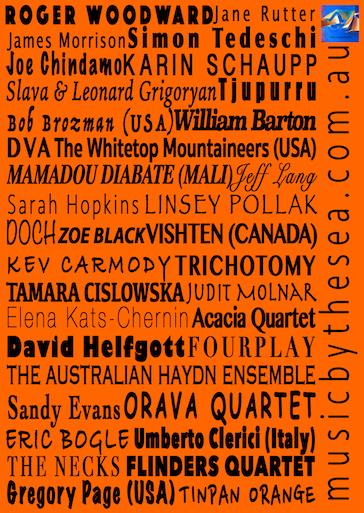 In 2006, Music By The Sea initiated ‘Unplugged Café’, voluntarily programmed the monthly event for the next nine years. ‘Unplugged Café’ celebrated its 10th anniversary in December, 2015. During that time, local artists have enjoyed ‘Unplugged Café’ as a platform for new works as well as an opportunity to perform before a live audience. Many of the local artists who perform/ed at ‘Unplugged’ since 2006 have gone on to receive regular, paid gigs at local bars and cafes. In 2016, Music By The Sea has commissioned Elena Kats-Chernin to compose the Sandgate Piano Sonata. The world premiere was performed on 2 April 2016 by Tamara-Anna Cislowska at the Sandgate Town Hall.